The internet of things (IoT) is playing a substantial role for every entity, organization and individual, and the real benefits are still coming to light. While the term was introduced in 1999, the concept took hold in the middle of the current decade. Research firm Gartner estimated 6.4 billion internet-connected things were in use worldwide just two years ago — and expects three times that many in use by the start of the next decade. IoT is revolutionizing more than could have ever been dreamed of, including the use and management of water. For facility managers, this is an encouraging development. The technology provides new opportunities to maximize the efficient use of water, presenting opportunities for municipalities to reduce operational expenses around construction, maintenance and more, while organizations can cut use and waste while saving money. What was once a yeoman's task of trying to effectively manage a grid, its piping and even the physical condition of the water-bearing network has been give life for the first time since the advent of indoor plumbing. IoT provides facilities personnel with the ability to virtually monitor the condition of their entire water network, through the use of environmental sensors, energy meters and building automation technology. These devices can relay information on their performance, condition and environment in real time to managers and technicians. Thus, with data, facility managers can help to process service requests, monitor and optimize consumption and use, and schedule available assets to improve the quality of each space managed, all while minimizing risk. According to Aramark, IoT in facility management is beyond compare in regard to benefits. For example, irrigation systems can report when grounds need to be watered based on soil and weather conditions and also send back information on how much water is being consumed, so you can save money today and plan for future water needs. According to computer giant IBM (which is slightly biased), IoT technologies can play a major role in organizational management of water usage. IoT sensors are becoming cheaper, and battery-powered networking solutions mean the tech can "light up" more of their network, while reducing costs in operations and maintenance. For example, IoT can improve water management water leakage detection, can create more efficient systemic water management, and improve water quality and safety monitoring. Additionally, the technology can control quality on water reserves, can provide transparency on consumption, and can lead to prescriptive maintenance on infrastructure. All good things. As offered by HPAC Engineering, IoT uses one common internet protocol (IP) platform to "connect all of the sensors and devices in a building to exchange and analyze information and optimize controls automatically. An important benefit is access to knowledge of outside-the-target-zone operating parameters enabling quick resolution of issues, even before problems emerge." However, IoT efforts should be grounded in three principles: reducing costs, reducing risk and improving the occupant experience. IoT-enabled environments can be hugely beneficial, but creating an intelligent building requires careful planning. "Adding components later in the process can be costly because of the large number of metering and sensing devices that must be applied to so many systems," the magazine states, "from electrical switchgear to HVAC equipment to water distribution systems." Facility managers with the ability to contribute to this path's success should establish goals and objectives as early in a project as possible to reduce the number of last-minute changes as the project develops. Preparation is key to keeping the dream of an IoT-enabled environment alive. 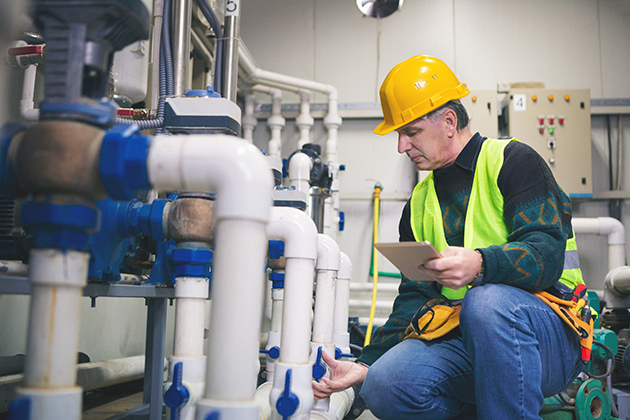 IoT environments — even if they manage and control a singular system such as a facilities water systems — create tremendous opportunities for managing intelligent systems within buildings that operate more efficiently. However, even with this level of automation, humans are still is required for optimal success; hopefully their success will just be a little easier to manage, less costly and drier.